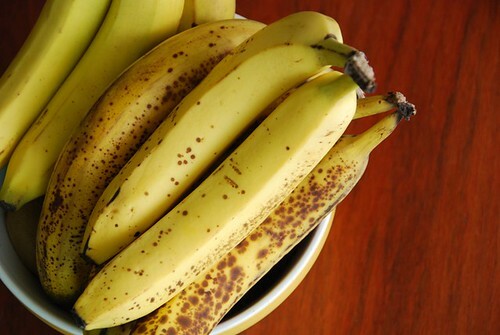 Food Blogga: How to Use Up Ripe Bananas? 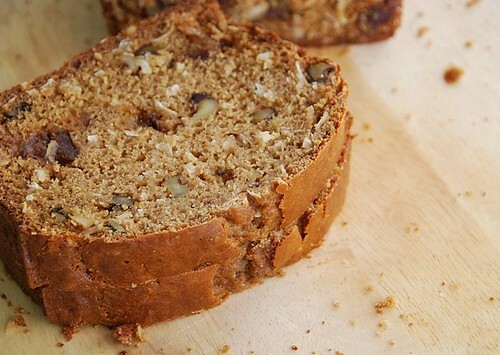 Make Banana, Coconut, and Date Bread. How to Use Up Ripe Bananas? Make Banana, Coconut, and Date Bread. I wasn't gonna do it. I swear. I was determined to get through all four posts of how to use up ripe bananas without making a banana bread. Because, really, does the world need one more banana bread recipe? After eating this banana, coconut, and Medjool date bread, I can say with certainty, Yes, it does. Each bite of this satisfying banana bread is chock full of creamy banana, toasted coconut, crunchy walnuts, and sticky, sweet Medjool dates. Enjoy it plain or toasted with a dab of butter. Or, if you really feel like splurging, top it with a thick layer of peanut butter, because everything's better with peanut butter. Please note that on March 1, 2009, I made a correction to the recipe below and have updated the recipe page. It should have 1 cup of low-fat buttermilk, not two. My apologies for any inconvenience this may have caused. Thanks, Bev! Made with fragrant toasted coconut, succulent Medjool dates, and crunchy walnuts, this is one unforgettably moist, delicious banana bread. Position a rack in the center of the oven and preheat to 350 degrees F. Coat 1 (8 1/2 X 4 1/2 -inch) loaf pan with cooking spray. To toast the coconut, place in a dry skillet over medium-low heat, stirring occasionally, until fragrant and lightly toasted, about 5 minutes. Set aside. In a medium size bowl, whisk the flours, baking soda, salt, cinnamon, nutmeg, and cloves. In a large bowl, beat brown sugar and eggs. Add buttermilk, oil, and vanilla; beat until batter is smooth. Lower the speed; add the bananas and beat briefly (it's ok if the batter has a few lumps). Add the flour mixture to the egg mixture and mix until just incorporated. Using a rubber spatula, fold in the dates, walnuts, and toasted coconut. The batter will be thick. Pour the batter into the pan. Bake for 60-75 minutes, or until the top is a deep golden brown and a cake tester inserted into the middle comes out clean. Check the bread about halfway through. If you feel like the top is getting too brown, then tent the pan with a piece of aluminum foil and continue baking. You can also place the pan on two stacked baking sheets in the center of the oven to prevent the bottom of the bread from getting too browned. Transfer the bread to a rack; let cool for 10 minutes, then unmold and place on a rack to cool to room temperature. It certainly looks like the world needs another banana bread recipe because the crust on yours looks delightful! I'm not a fan of cake-like "breads" (read: most banana breads that are basically square muffins that are basically cakes) so this looks like my kind of banana bread recipe. Love the idea of adding delicious toasted coconut - I will second your sentiment that the world needs another banana bread if it's this one! This looks so healthy ! I don't bake often enough with whole wheat flour but this recipe sounds so moist and delicious! I have a brand new bag of coconut to use too.. thanks for sharing this recipe Susan! Yum! Nothing wrong with a banana bread--especially when you're adding coconut! Yum, yum, yum. I can't wait to try this one for myself! Why yes, I do have some bananas to use up, how did you know? This looks gorgeous! OK, how did you end up with so many ripe bananas? Was it an impulse purchase? An uncontrollable craving? Oh, that's funny. Can't fight making banana bread when you have to use up a bunch of bananas. But it's got such yummy stuff in it - dates, walnuts - looks great. I love Banana Bread and Medjool Dates, and your recipe looks so delicious! If only I had enough of those key ingredients in the house at once! Photos and recipe look wonderful. Sometimes I think I subconsciously (ok, so maybe consciously) let bananas go bad just so I have a good excuse to make banana bread. Oops, bananas are over ripe, i guess i'll just *have* to make banana bread. Hummm, looks so good, I love the incorporation of dates, I bet it must make for a sweet sweet bite. I just made banana bread last night. I don't think I could ever get enough of it, and I love to see different versions. I bet the dates are really great! I actually have ripe bananas at the moment too, must be fate! That sounds delicious. I can't wait to try making it. Your right we do need another banana bread recipe after seeing this one! P.s. wondering if you got my email requesting some RI recipes?? I'm not sure if it went through. Mmmmm....banana and coconut sounds utterly tropical! And delicious! 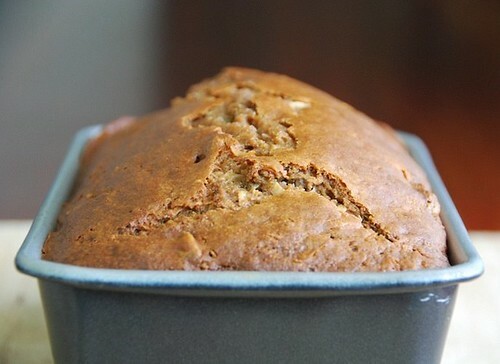 I've always loved banana bread, so I love having another one to try!Looks delicious! I just made banana ice cream, you should definitely give that a try. The banana makes it even smoother and creamier! i make a very similar recipe, but the dates would be an excellent addition the the tropical flavors of banana and coconut. Another banana bread recipe? Another soup recipe? Another sunshiney morning? Yes to all! Great recipe...now I know what to do with the bananas that are sitting on my fruit basket. Thanks! You can make as much banana bread as you like! That looks perfect. Truly a must make next time I have enough bannanas. Sounds like an oasis all by itself. This is a great way to save ripe bananas. I usually make chocolate banana bread with them. Chocolate, coconut and dates must make a great combination. A must try. I caved and created a new banana bread recipe the other day too. Mine has cinnamon chips :) This one looks great. I recently used dates in a bread and I was really pleased with how well they worked out. I'm not a big fan of nuts, but that toasted coconut is a great idea! chris-How sweet of you to say. Thanks. kara-Thanks. That made me feel good. elyse-Bananas and coconut are perfect together. tw-I buy about 10 a week! italian dish-I can't resist dates. culinarywannabe-I really love them, especially in quick breads. foodhunter-I hope you enjoy it! annie-Thank you! I'll email you this week. lynda-That makes me feel good! Thanks! farida-Choc in this bread would be divine. I've got to try that. Thanks! lori-Ooh, cinnamon chips sound delicious. Thanks for the idea! Not only did you make banana bread which is one of my very favourites. You also added two more of my favourite ingredients and blew the roof off banana bread. I thought the batter was awefully thin! I didn't get an email about the update. It turned out delicious anyway! We had it for breakfast this morning. I'm glad it wasn't a disaster! never enough of banana breads. Although this is american recipe,we adopted it in Europe too..